Signed into law by President Jimmy Carter in 1978, National Grandparents Day falls on the first Sunday following Labor Day and is set aside to remember and acknowledge the contribution of senior citizens to our country, community and personal lives. Whether you wish to honor your own nana and paw-paw, or have room in your heart and schedule to adopt a grandparent, the official flower for this holiday is the lovey forget-me-not. Pretty in a pot on the porch or windowsill, the forget-me-not can also be made into a corsage or boutonniere for the day, and are a great way to remind someone whose memory is getting a bit rusty that they are important, they matter, and they are loved. There are many different species of forget-me-not, with most being native to the Northern Hemisphere and several to New Zealand. Most grow in wooded areas, typically around streams and shady riverbanks. 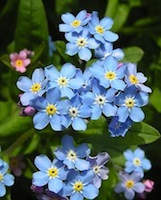 The leaves are soft and fuzzy, which give the plant its botanical name, Myosotis– Greek for “mouse ear.” Common to several myths and legends, it is said this dainty blue plant earned its common name when a knight and his lady were strolling by the river and he reached down to pick her a small bouquet of flowers. Weighed down by the weight of his armor, he fell into the river and drown, but not before casting her the flowers and pleading for her to “forget me not.” Since medieval times, the flower has been a symbol of remembrance for kings in exile, lovers who are separated by long distances, and Freemasons. Known for its distinctive powder blue blooms, this plant can actually come in flowers that are white and pink as well. Each tiny 5-petaled flower has a buttery yellow center. 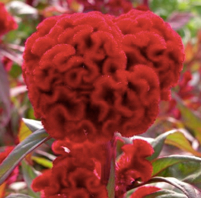 Individual flowers grow in clusters of 5-10 blooms, making this flower appear larger than it actually is and giving it a soft and cushiony appearance. The stems themselves tend to be shorter, meaning it lends itself better to cute, short tabletop arrangements rather than tall vases as a cut flower. Consider making an old fashioned tussie-mussie or other small, handheld bouquet with it or else tying a cluster of flowers into ribbon and onto a wrist as a corsage or pinning it onto a lapel. While it does not have a strong fragrance, the bright-eyed blooms of the forget-me-not are a memorable flower that go a long way in letting someone know you are thinking of them.